We bring forth an attractive range of Mens Woollen Socks, which is designed using high quality thread and latest techniques in compliance with the international quality standards. Our offered socks are available in different sizes, colours and patterns so as to cater the needs of our clients. 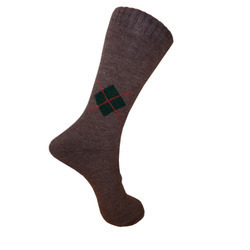 In addition, these socks are ideal for the professional environment and can be availed at cost-effective prices. Looking for Mens Woollen Socks ?